The Ojibwe language is the language of the Ojibwe people, one of the largest First Nations in Canada, which is still spoken across Canada and the US today. If you are learning this interesting language, these flash cards with pronunciations will give you a good start. 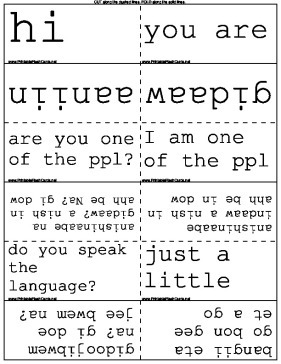 do you speak the language? gidoojibwem na? gi doe jee bwem na? do you understand? ginisidotam na? Gin is i doe tom Na? where are you from? aaniindi wenjibbyan? how many (or) how much? Aaniin dash minik? Thursday niiyo giizhigad (nee yo) "
Saturday giziibiigisaginige-giizhegad (gezee bee gis saga ni ga-"
day before yesterday Awasonaago (Ah was on a go) add CHI for the day before that day. stop being mean Gegwa jizhiwebzike ezhichiged. sorry about "X" Gaawiin jidaa "X" gaa.